Province House is not only Nova Scotia’s seat of government, it’s one of the best examples of Georgian architecture anywhere in North America – another fine legacy of Halifax’s strong British history. 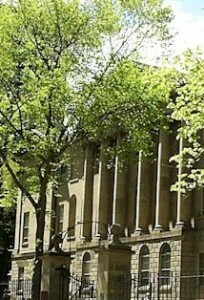 The sandstone building, completed in 1819, marks Canada’s oldest provincial legislature and Britain’s first overseas self-government. The structure was described as ‘a gem’ by famous author Charles Dickens when he visited in 1842. Free tours are led by guides who win high praise for sharing stories about Nova Scotian and Canadian history as well as explaining the building’s unique features. Pay special attention to the 19th century Legislative Library. It used to be a courthouse, where 6 pirates from the ship Saladin went on trial in 1844 for murdering the rest of the boat’s crew. A subsequent storm drove the ship, carrying valuable silver, onto Nova Scotia’s shores. Soon the whole story was being tried in court. A lawyer defended the crew and blamed a dead passenger for the chaos but the judge disagreed and sentenced 4 of the mutineers to hang. Only the cook and cabin boy were cleared. Opening hours: July and August. Monday to Friday, 9am to 5pm. Weekends and holidays, 10am to 4pm. September to June. Monday to Friday, 9am to 4pm.